When you create a trend graph one of the best ways that you can consider is to start from the trend graph examples. Now we will present some trend graph examples on trend graph for proper understanding of this diagram. Sample trend graph example drawn with the Edraw trend graph maker. You can download and modify these trend graph for your own use. This template can reduce the amount of time to create great trend graph by using built in symbols right next to the canvas. 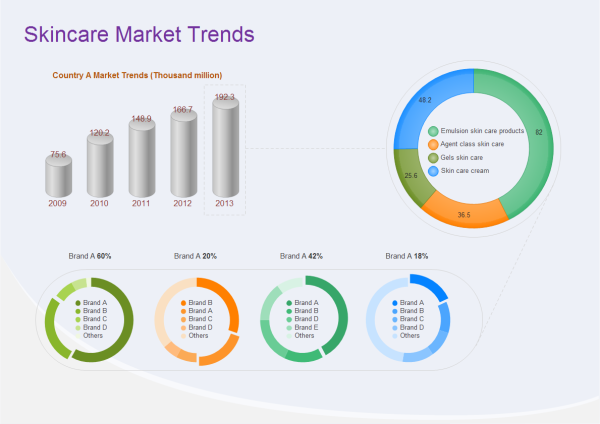 Trend graph is typically presented in the format of a chart such as the following skincare market trends chart that indicated a positive or growth factor and a negative or decaying factor. Discover why Edraw is the optimal maker to create trend graph. Try Edraw FREE.